College Night is October 14 : Help spread the word! 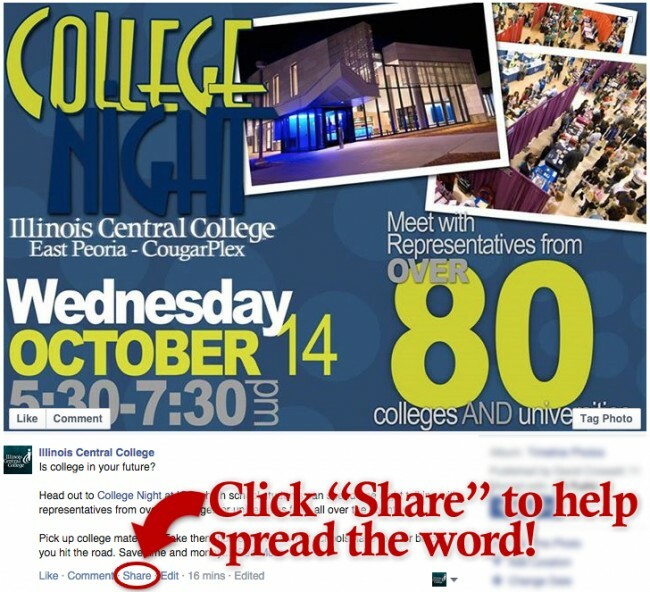 College Night at Illinois Central College is coming up on Wednesday, October 14 from 5:30pm – 7:30pm! This is a great opportunity for area families to come and meet with recruiters from over 80 colleges and universities in one place! Better still, it’s a great opportunity for ICC departments to welcome and meet with prospective students. Click on the image below and click the ‘Share’ button in facebook to tell your friends and family about this amazing opportunity to help make their college decisions! College Night 2015 is coming up on Wednesday, October 14 from 5:30pm – 7:30pm at Illinois Central College. Save some time making college decisions by meeting with representatives from more than 80 colleges in one place!